This painting of Hirst Lock on the Leeds-Liverpool Canal is tucked away at the end of a dark corridor off the main council chamber in Bradford City Hall. It first came to my notice when local barber and historian Peter Randall showed me the watercolour sketch he owns which artist A Wilson did before producing the finished oil painting in 1878. One thing puzzled me. When I went to try and find the spot where Wilson had sat to make his painting it seemed impossible. Even allowing for fewer trees, it would have been difficult to see Hirst Mill Crescent from that side of the lock. 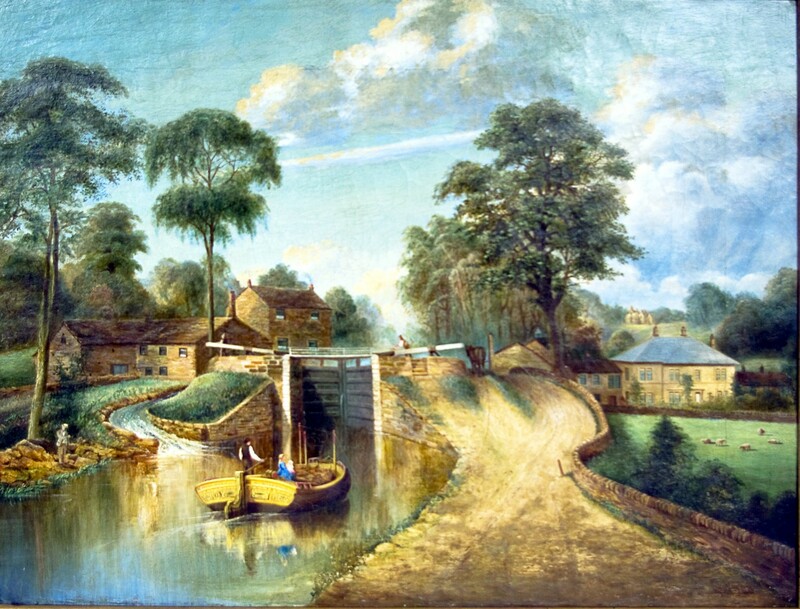 The canal is lower from that viewpoint – hence the lock – so I could only imagine that the artist had used his imagination and painted what he knew was there rather than what he could see. But no. I did him an injustice. I’d fallen for the old trap of imagining that the rural landscape stays largely unchanged for hundreds of years. 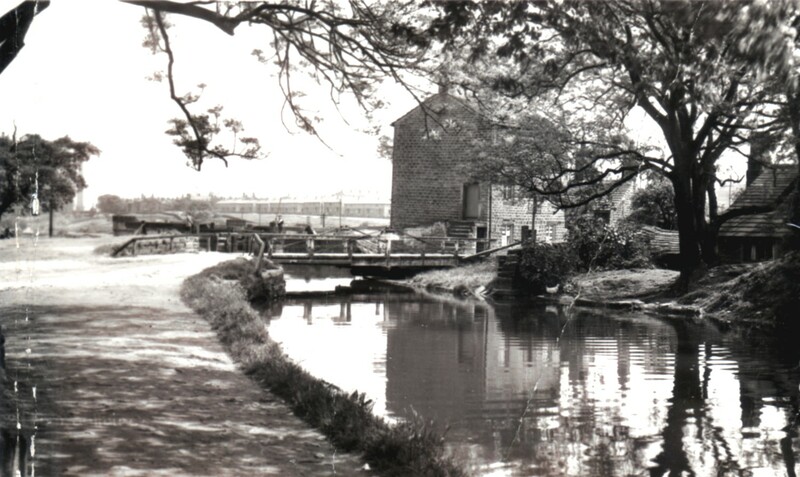 Peter put me straight, producing this old photo (right) which clearly shows there was a bridge over the canal just below the lock and that is where Wilson sat to paint his picture. 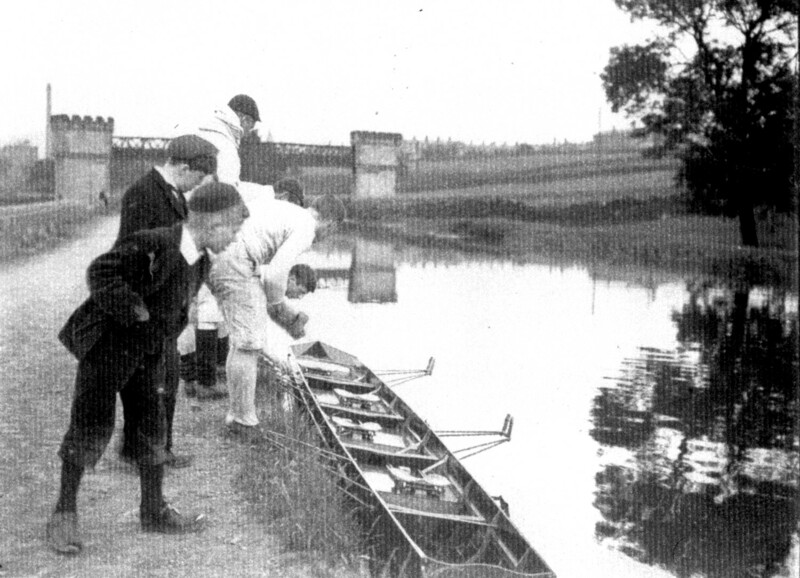 In fact Hirst Lock has changed dramatically since that artist captured the two men heading into the lock, watched by a fisherman on one bank and the lock keeper above. 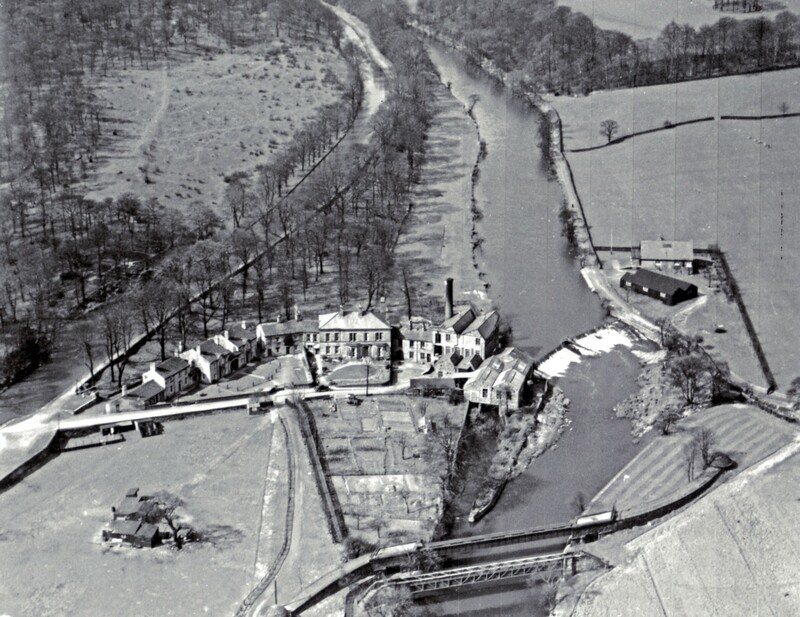 The two smaller buildings next to the by-water appear to be cottages, possibly built for workers at Hirst Mill or one of the two farms on the site. We know from later photographs that one was turned into a tea bar. Some of the foundation stones now form part of a garden rockery after Hirst Wood Regeneration Group transformed the site. The taller building (seen here from the other side of the canal) was once thought to be the lock-keeper’s cottage but in the 1861 census it is occupied by cabinet maker John Anderton, his wife Leah and four-month-old daughter Margaret. It might well have doubled as a warehouse for loading boats with goods from Hirst Mill with the lock keeper living, as he does today, just up the canal at Dowley gap. The Jowetts were eventually replaced by the Whincup family and then Frank Bagshaw who became very popular in the area for serving refreshments, including delicious ice cream which many older residents still remember fondly. 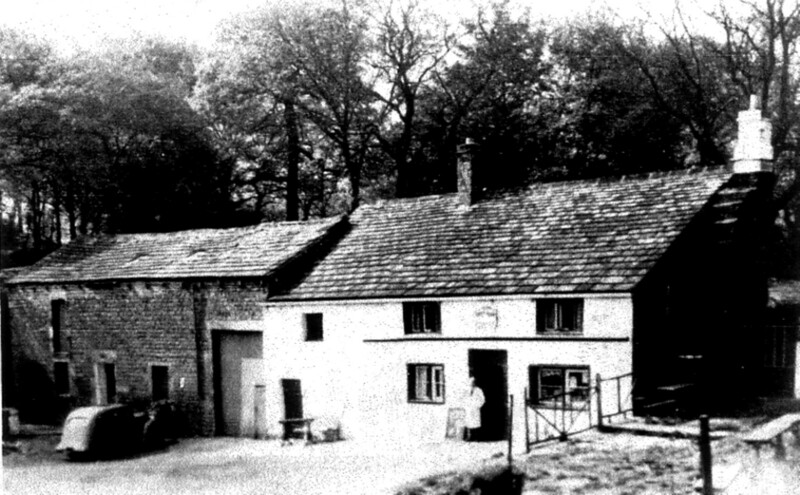 The farm was pulled down in 1962. 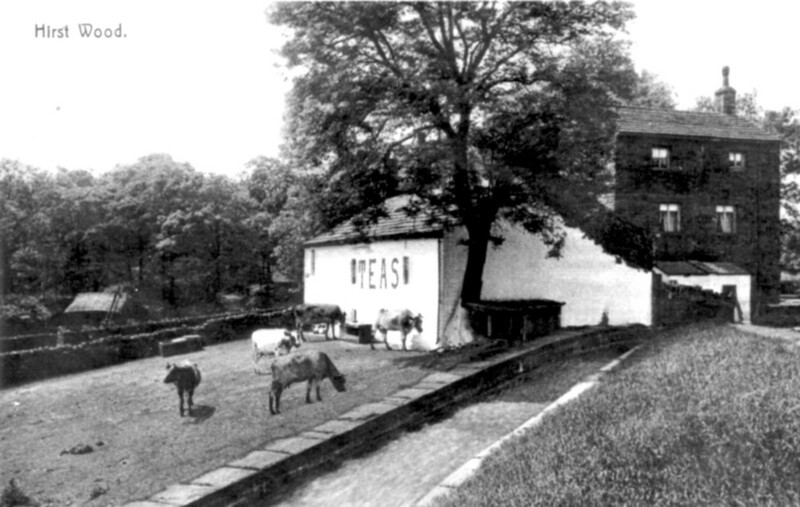 Across the canal, what are now houses in Hirst Mill Crescent were part of Hirst Farm outbuildings. The present disused garden centre was once an open field with a few farm huts on it while the woodland between the path and the River Aire was covered in garden allotments. Sometimes progress seems to mark decline rather improvement.